For many people, Bangkok is the gateway to the Southeast Asian world and is often scheduled as a stopover for a few days. 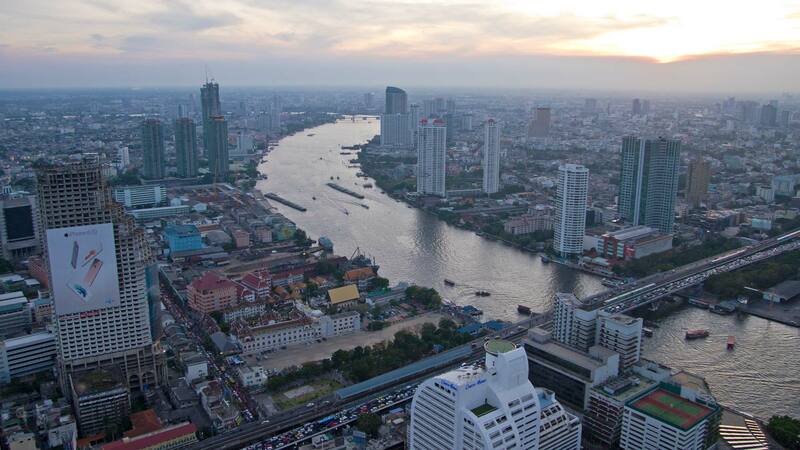 To get to know Bangkok, however, these 2 or 3 days aren’t long enough. You could easily spend a week or two without looking at the same thing twice. 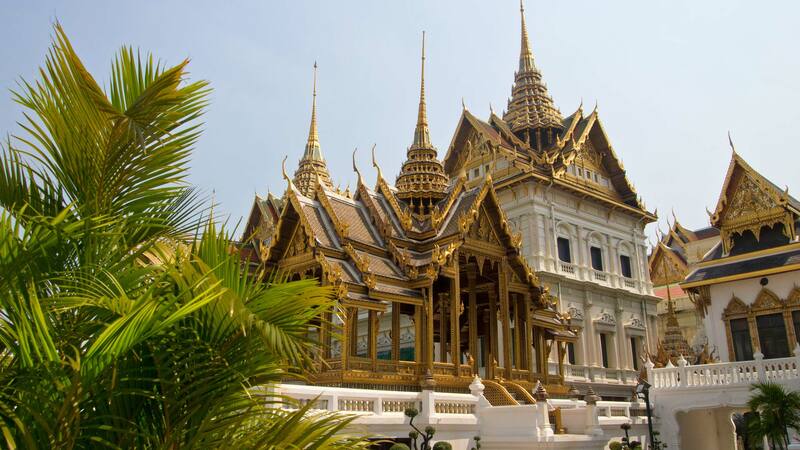 Traveling to Bangkok is relatively easy, as there are direct flights and stopovers from all the surrounding countries, as well as from Europe or the Emirates. Flights from neighboring countries arrive at Don Mueang International Airport (DMK) and flights from Europe etc. arrive at Suvarnabhumi International Airport (BKK). Cheap flights to Bangkok can be found at Skyscanner for example. There you can compare the prices by days, see the flight duration and stopovers. Everything is very clear and absolutely recommended for a first comparison. If you are traveling to Bangkok from other cities in Thailand or from neighboring countries such as Cambodia, then there are more possibilities. In addition to the airplane you can choose long-distance buses and trains (within Thailand) to Bangkok. Prices and times can be found at our partner 12go.asia. We have been to Bangkok many times and have tried many hotels. The Chatrium Riverside is one of our favorites. Directly on the Chao Phraya River with boat access to the Sathorn Pier, where the express boats leave, and the BTS station Saphan Taksin. Furthermore, the hotel offers an extensive breakfast buffet, a swimming pool and large modern rooms with views over Bangkok. Just the perfect place for a bit of luxury on vacation. Find more hotels in Bangkok here. 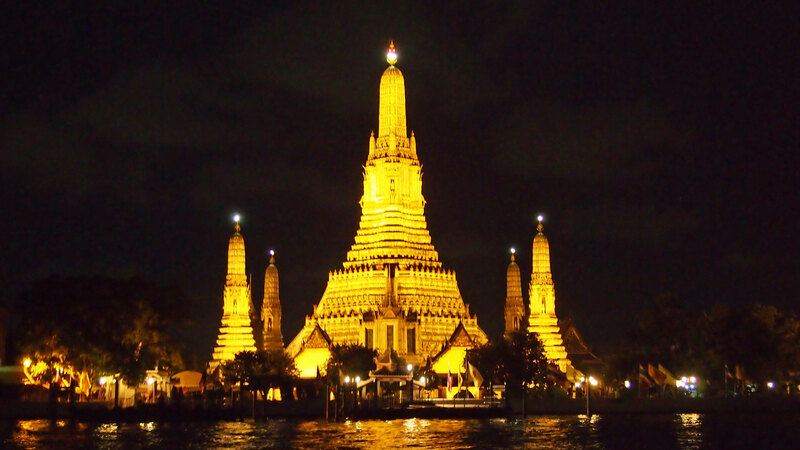 The Wat Arun is one of the most famous and most beautiful temples of Bangkok. The central tower of the complex, called the Phra Prang, is 80 meters high and offers you a great view over the river with the Grand Palace and Wat Phra Kaeo in the background, if you make it to the top. It’s not only the view which is impressive, but also the thousands of mosaics stones with which the Prang is decorated. If you take a closer look you can see how the mosaics represents the path of Buddha’s life from his birth to his death. The full name of the temple is “Wat Arun Ratchawararam Ratchaworamahaviharn”. It is named after the Hindu deity Aruna, the god of the dawn. Therefore, the temple also bears the nickname Temple of the Dawn. Even though the most beautiful to look at is the temple at sunset and at night when hundreds of lights let the Wat Arun shine golden. Admission to the Wat Arun is 50 baht per person and of course pay attention to your clothes, because knees and shoulders should be covered out of respect. You can also borrow some clothes at the entrance, if you have nothing suitable to wear. To get to the Wat Arun you have to cross the Chao Phraya River, as the express boat doesn’t stop at the western bank nearby. This works best from the Tha Tien pier. There you can take a shuttle boat for about 5 baht to get to the other side of the river. 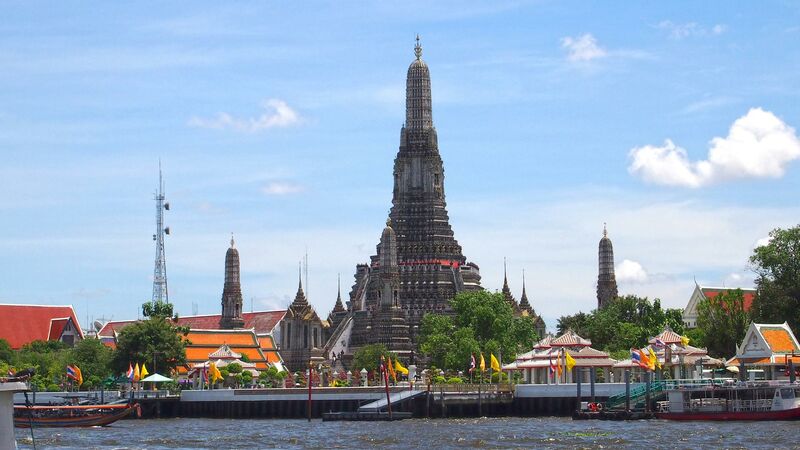 Note: You can also discover the Wat Arun on a tuk tuk tour with other temples like Wat Traimit and Wat Pho. A really nice trip. “Wat Phra Sri Rattana Satsadaram”, as the Wat Phra Kaeo is called with its real name, is the temple of the Emerald Buddha, which is now situated in the ancient Grand Palace. Since the King is greatly admired in Thailand, almost every Thai visits here at least once in his life. 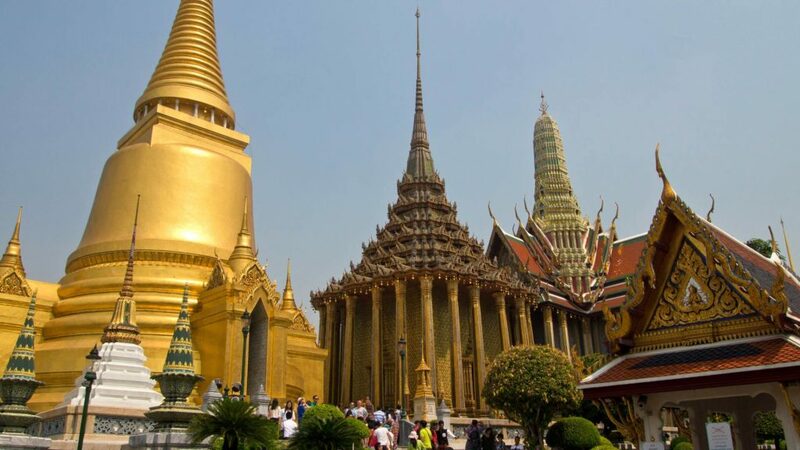 I would even say that the Grand Palace with the Wat Phra Kaeo is the most important attraction of Bangkok. The interior of the temple is very impressive with its golden Chedi, statues and the chapel of the Emerald Buddha (Phra Ubosot). It’s not easy to describe the temple and I think everyone should have seen it at least once. More information about the temple you can find here at Wikipedia. The Wat Phra Kaeo and Grand Palace open daily from 8:30 A.M. to 3:30 P.M. and there is an entrance fee of 500 baht for tourists – Thais can visit the temple for free. However, you should ensure that your legs and shoulders are covered. If you don’t have some proper clothes, you can rent them at the entrance. Many visitors do that, so there will probably be a long queue to borrow some clothes. If you are interested in more information about the Wat Phra Kaeo, you can visit the Grand Palace with a guide on a walking temple tour. 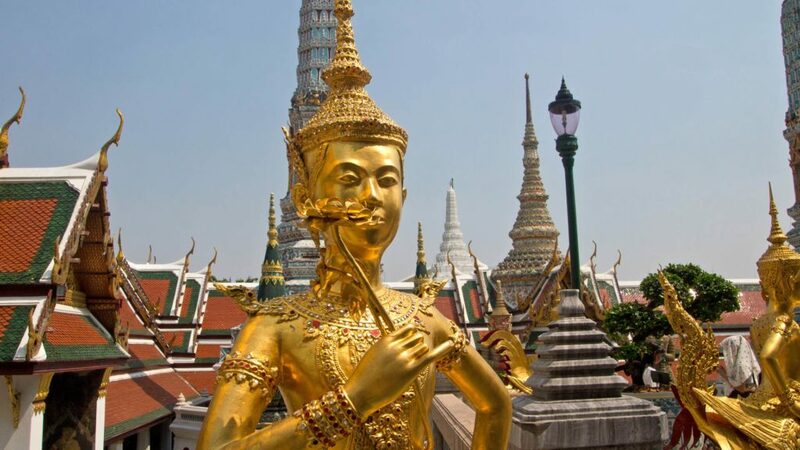 In the center of Bangkok’s old town is the Wat Pho temple, not far from the Grand Palace. He is still called Wat Pho, but its official name nowadays is “Wat Phra Chettuphon Wimonmangkhlaram Ratchaworamahawihan”. The whole temple complex with its garden, Chedis and Prangs is well worth seeing, but the highlight is definitely the Reclining Buddha statue. The 45 meter statue is a very popular photo theme and really impressive. 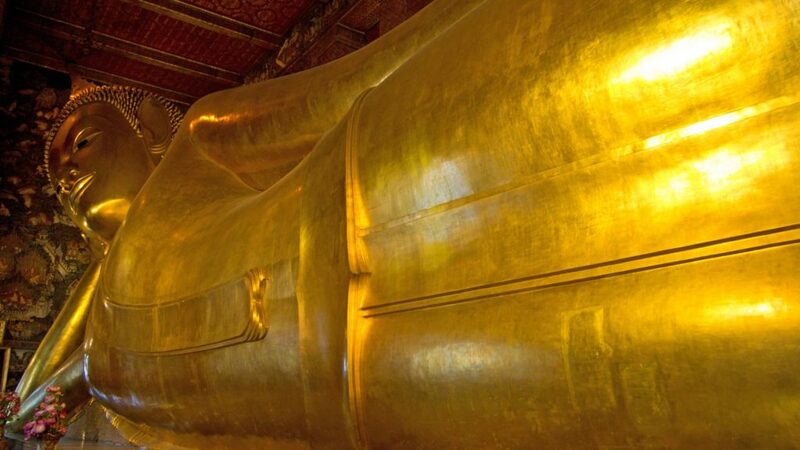 The Wat Pho is open daily from 8:30 A.M. to 6:30 P.M. and costs 100 baht entrance fee for the reclining Buddha. You can visit the rest of the complex for free. 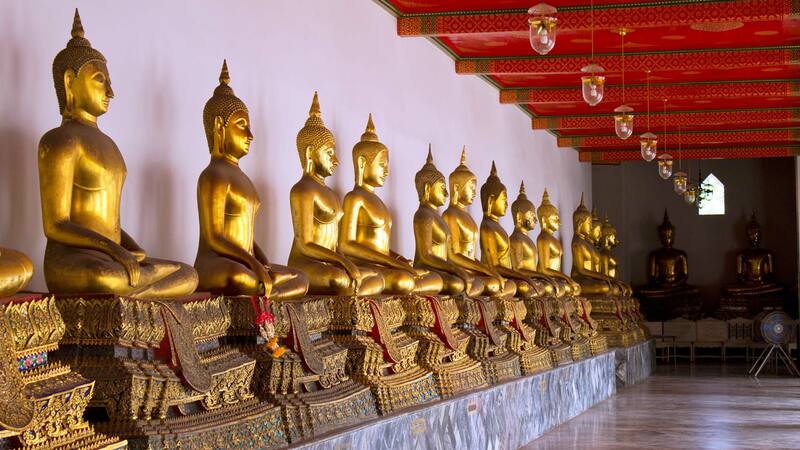 Wat Pho is also home to one of the most famous massage schools in Thailand that you can even visit as a tourist. Either you take a course in the art of Thai Massage yourself or get a massage there. Prices starting at 260 baht. 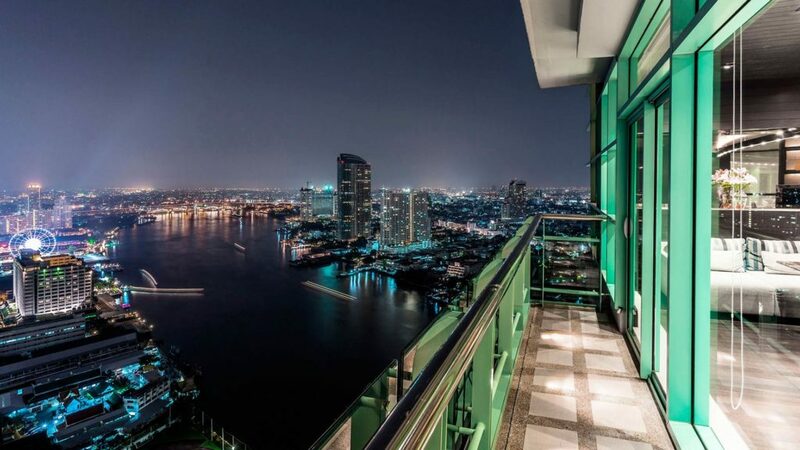 Bangkok has a fascinating and breathtaking skyline and where could you enjoy it more than from one of the skybars? The first skybar I’ve visited was the Sirocco Skybar on the Lebua at State Tower, which is also a bit due to the Hangover 2 movie. The cocktails are about € 15 which is indeed not cheap for Southeast Asia, but the admission is free and the views amazing. Keep in mind that there is a smart casual dress code, which means you have to wear long pants and closed shoes, at least for the men. I can also recommend a visit to the Marriott Hotel with the Octave Rooftop Lounge and Bar. Located on the Sukhumvit Road it has also a terrific view but the drinks are a lot cheaper than at the Lebua. But you should also wear long pants and closed shoes. In the meantime I’ve visited some more skybars, like the Baiyoke Tower II or the Sofitel SO Bangkok. It’s always nice to see the illuminated skyline from above. That’s definitely one thing you should not miss during your time in the Thai capital. 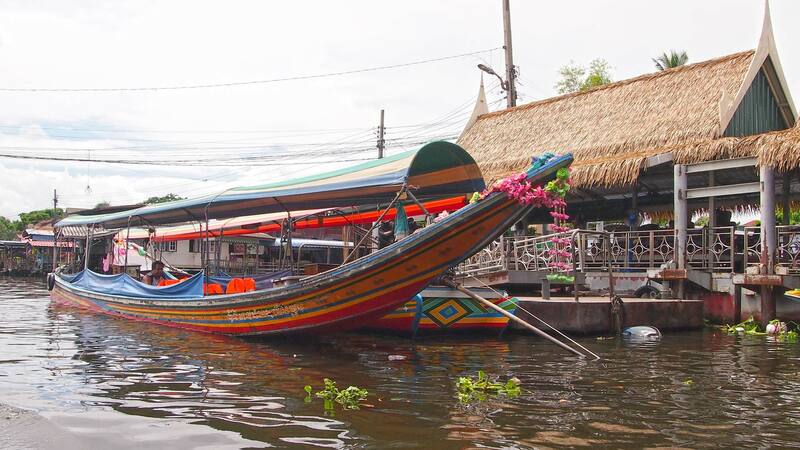 A tour up and down the Chao Phraya River is on the wishlist amongst many visitors and there is a high range of the long-tail boats for such ventures accordingly. The price set by the drivers is already relatively high and the real price depends probably on your negotiation skills. 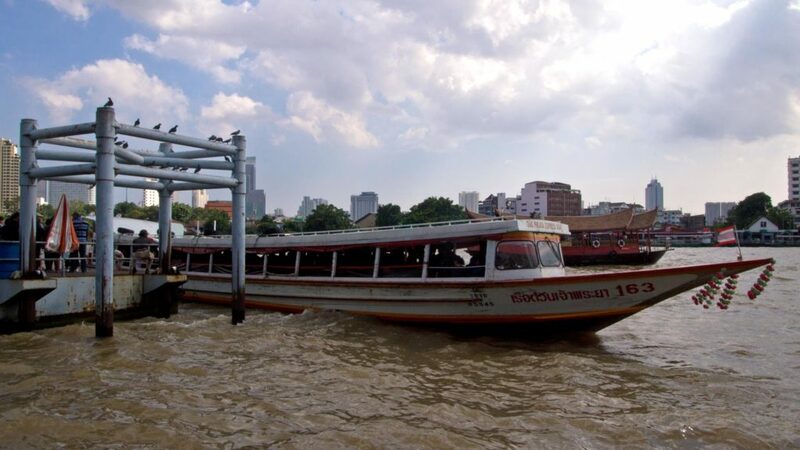 My recommendation, even if the boats are relatively full, is a river tour with Chao Phraya Express Boat Service. You can choose between the tourist boat with the blue flag or the local boats, where a trip will be 10 baht at most. For the route network of the boats you can read our transportation guide to inform in advance. 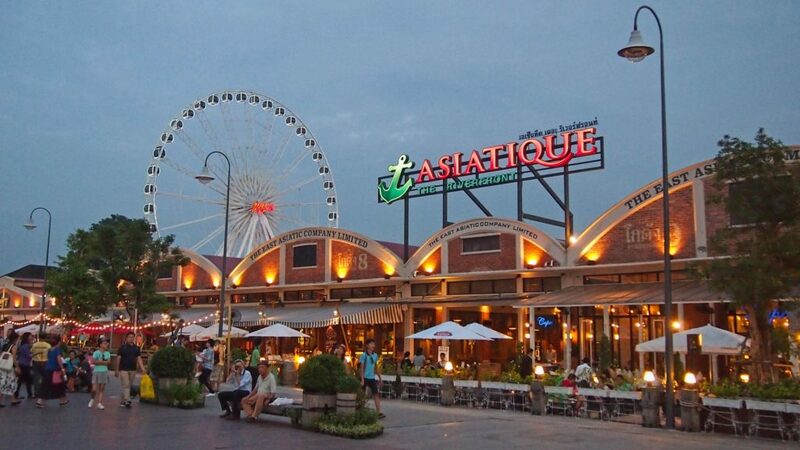 The Asiatique Night Market is an artificially designed night market for tourists along the Chao Phraya and also offers a free boat shuttle from the Sathorn Pier. The area of the market is well laid out, very well maintained and in addition to countless shops you will also find many restaurants and bars and a Ferris wheel. Since the night market was created for tourists, the prices here are a little higher than average. Well worth a visit anyway and if you want to save some money while eating, then just leave the night market and find numerous food stalls with cheap and tasty food on the streets. The green oasis of Bangkok. If you have enough from the hustle and bustle of city life, you can take a break here. 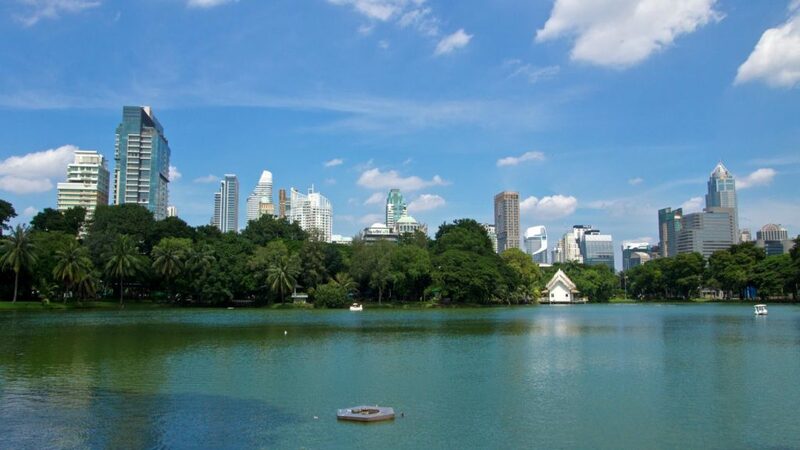 In the Lumphini Park you can go for a nice walk, take a paddle boat ride on a lake or just enjoy the atmosphere. In the evenings there is a public workout – join the hundreds of people who dance to the music and enjoy a workout. This is a nice change of pace from big city life and definitely one of my favorite places in Bangkok to recharge your battery once again. 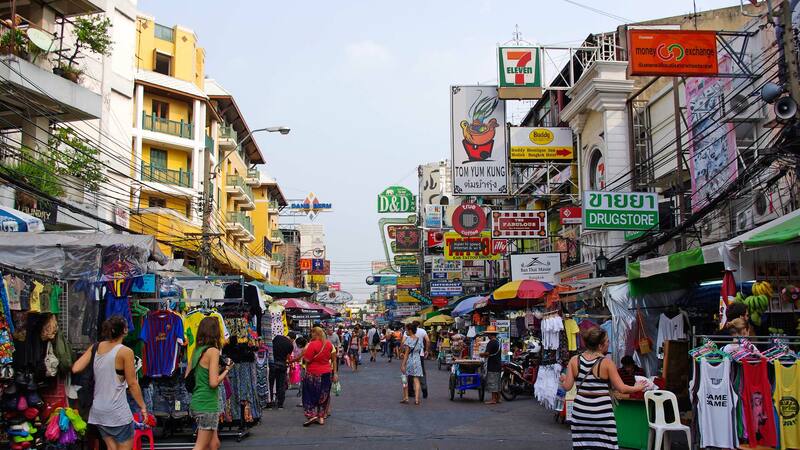 The Khao San Road is a Mecca for backpackers in Bangkok. There are plenty of affordable accommodations, bars, clubs, food stalls, small shops and much more. Over here you can try fried scorpions or various other insects (by the way: grasshoppers are not that bad). Every visitor of Bangkok should have explored this crazy street. Definitely worth a visit. If you prefer it a little quieter, although probably “quiet” is the wrong word, you should visit the more decent parallel Rambuttri Road with stalls, hostels, restaurants and Shisha bars. Also very cool! 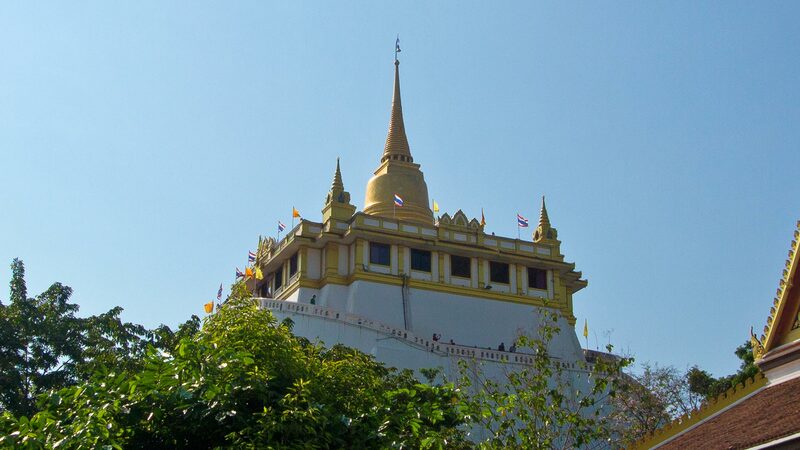 As one of the oldest temples in Bangkok the Temple of the Golden Mount or “Wat Saket Ratcha Wora Maha Wihan”, with its full name, is a well-known attraction of the Thai capital. In order to enjoy the view from the 79 meter high-banked mountain of the temple, 318 steps must be taken. 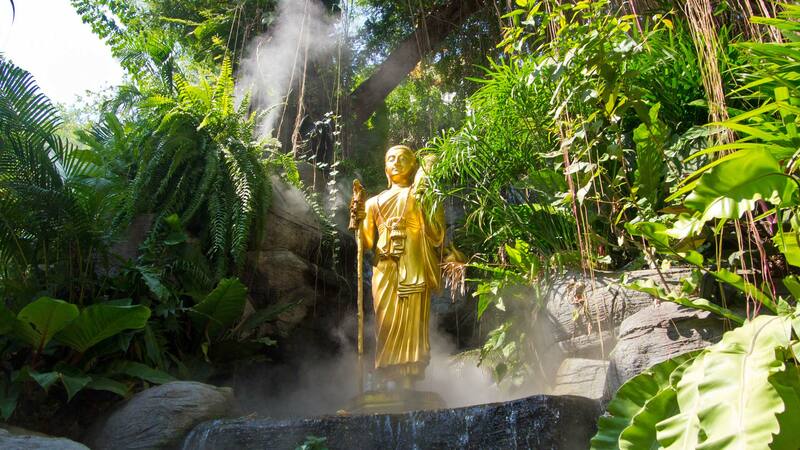 But it’s worth it, because the way up is already decorated with Buddhist statues and small waterfalls. The Wat Saket is open daily 8 a.m. to 5 p.m. and has an admission of 20 baht, which you have to pay for the way up. You can visit the rest of the complex for free. To get to the temple you can take the Klong boats at Petchaburi or Central World Plaza. 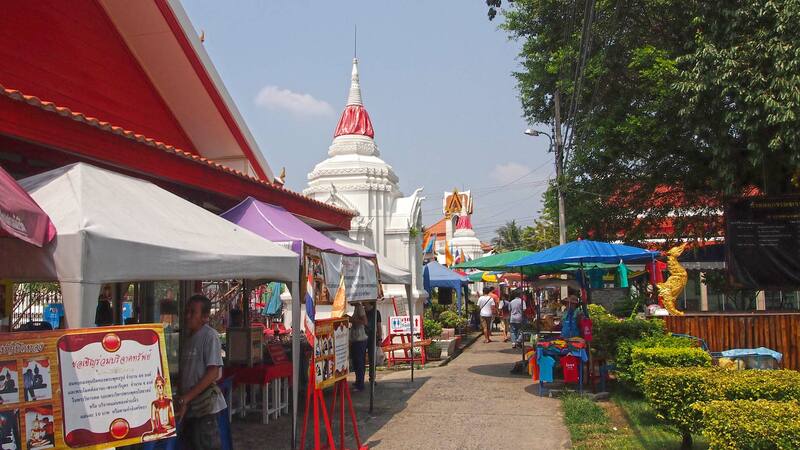 However, you can reach the temple also within walking distance, as it is located just 2 km south of the Khao San Road near Damrong Rak Road. With its golden Chedi you can spot it from far away though. 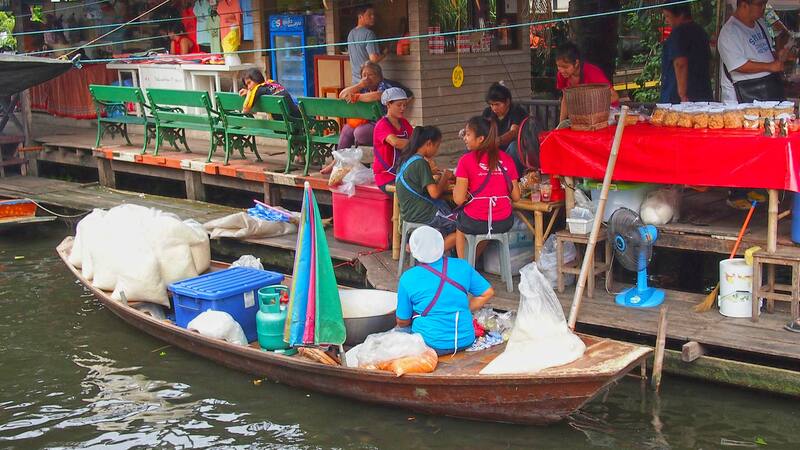 The floating market Taling Chan is perhaps not exactly what you would expect. At least that’s what I thought. In a floating market, I imagine to sit in a boat and drive around and buy something at one or another boat. The Taling Chan Market is different. There are many common food stalls, souvenirs etc. and a floating platform with boats around it. You can buy the food from these boats and then sit comfortably cross-legged on the small tables and eat the just purchased treats. A little different than expected, but still very nice. Only a few tourists hang around here and you are mostly amongst locals. The market is open every weekend from 8:30 A.M. to 2:00 P.M. and is easily accessible by taxi, which – depending on where your hotel is – isn’t that expensive. We paid from the Khao San Road to the market around 100 baht. My advice: skip breakfast, leave early in the morning to the market and fully stuff yourself there. 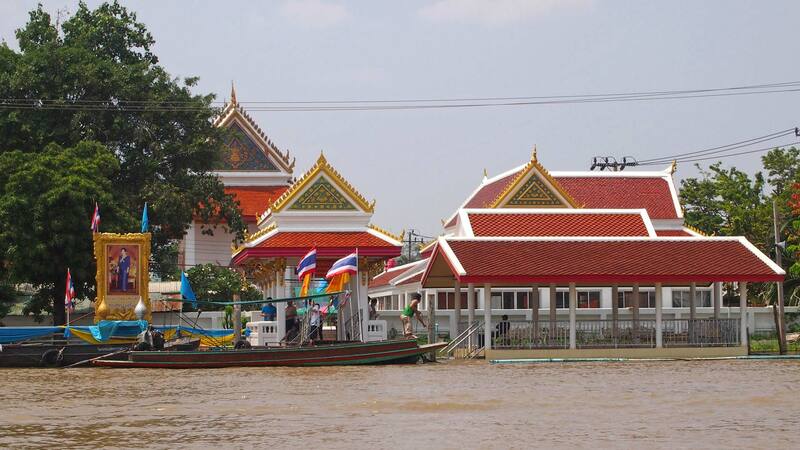 Not only on the Chao Phraya you can make a great boat tour, but also on the small canals (in Thai called Klongs). 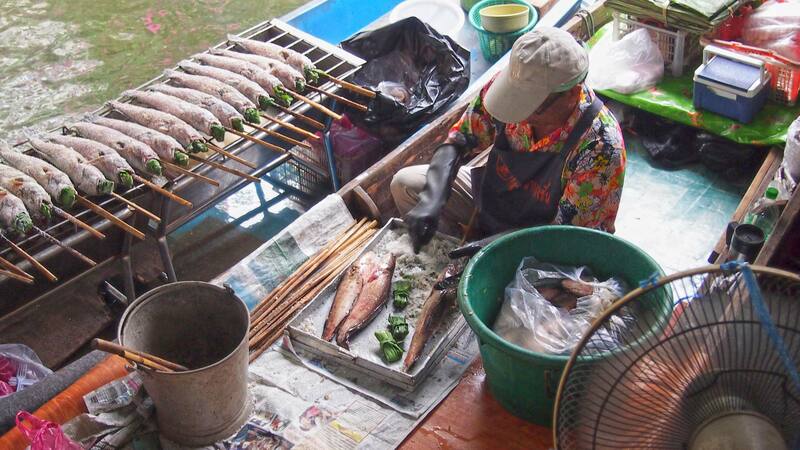 Good to combine with visiting the Taling Chan Market, because you can do great tours alone or in a group from there. It is very much worth it to go through the canals and to observe the local life. The Chatuchak weekend market is one of the largest markets in the world and you can find a bargain or two – or even buy your complete equipment here. 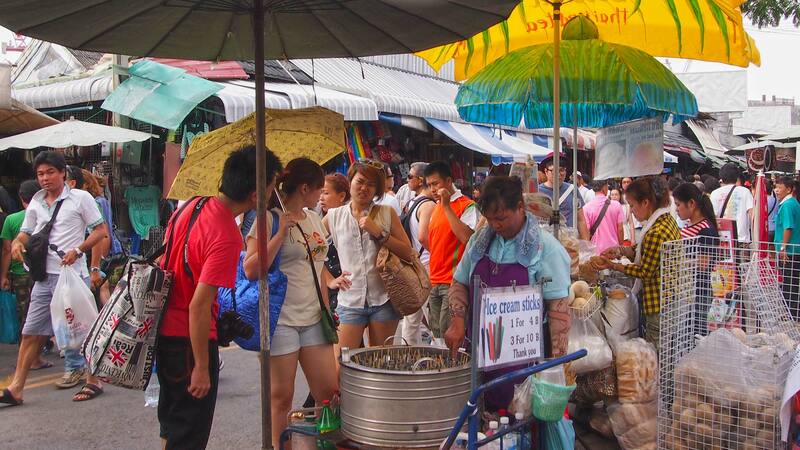 There are over 10,000 stalls from clothes to souvenirs to delicious Thai cuisine; the market offers everything. Since it is so huge, it usually takes almost a whole day to visit the market. For more information you are welcome to read our article on the Chatuchak Market since this goes beyond the scope. 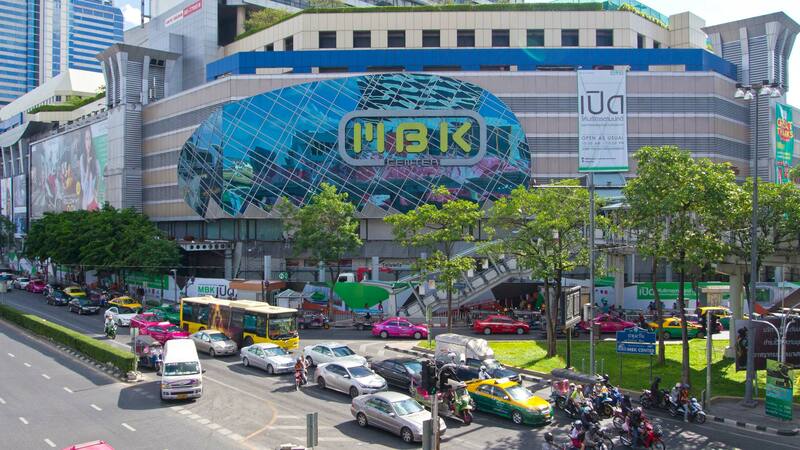 Very popular for Thais are also the many shopping malls in Bangkok. It is best to take the BTS Skytrain to Siam and take a walk from there. 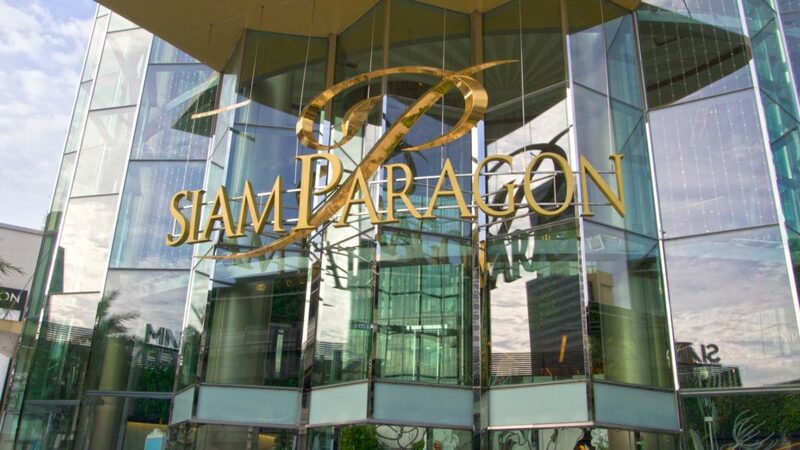 Close to the high-priced Siam Paragon and Siam Center is the MBK Center located, which has many favorable products such as clothing, shoes, souvenirs, movies (original and copied) and more to offer. You can still get things a little cheaper, if you’ll walk along the Ratchadamri Road and past the Central World Plaza. After crossing the Saen Saep river, you find the Platinum Fashion Mall, where almost only Thais go shopping. Everything here is much more cheaper and – how could it be otherwise – you can find hundreds of stalls in front of it, of course. This area is a shopping paradise! 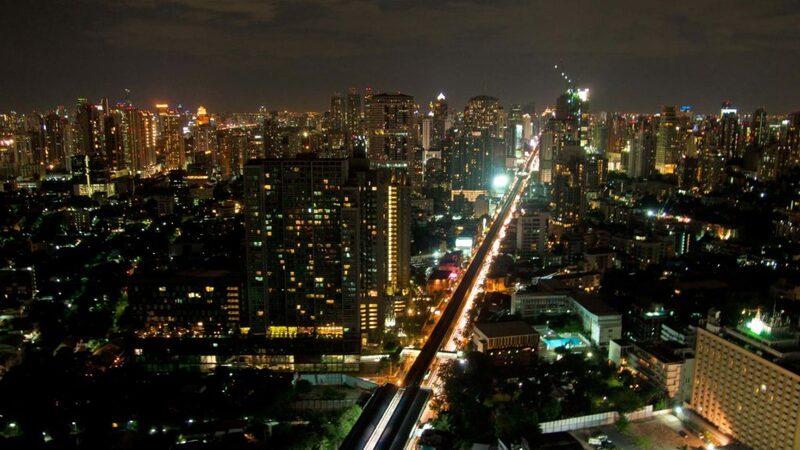 The Sukhumvit Road is one of the longest streets of Bangkok and even leads to Cambodia. Over here life pulsates at night. 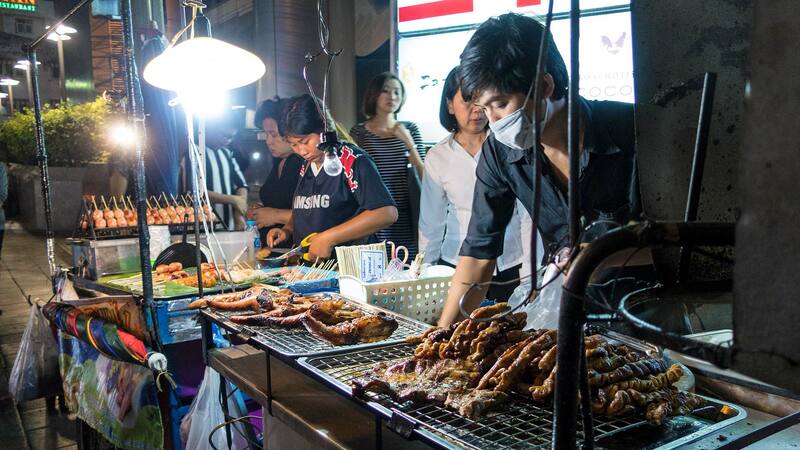 The street is lined with stands and food stalls, especially between the BTS stations Asoke and Nana. 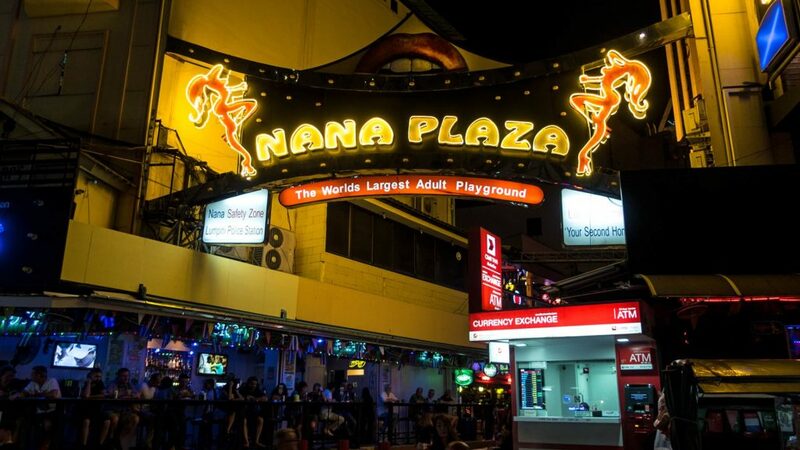 In Soi 4 Nana Plaza and Soi 11, called Soi Cowboy, a lot of bars and clubs can be visited. These are popular red light districts with beer bars, strip clubs and discos. But if you only want to drink a beer and watch the people, you can do that easily without being disturbed too much. Chinatown itself is an attraction already. The small streets with many Chinese shops have their own special charm. From the Ratchawong Pier Chinatown extends to the Charoen Krung Road. Here you feel a bit like in China, instead of in Thailand with all the huge blackboards full of Chinese characters. This is a whole new world in the midst of Bangkok. 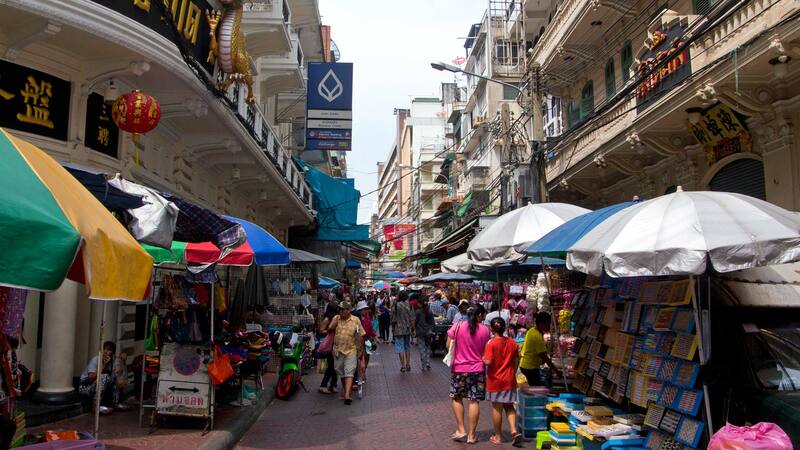 Furthermore, there are also many shopping opportunities in plenty of the alleys where you can buy cheap products, like the resellers in Thailand do. By the way, on a guided tour you can discover the culinary highlights of Chinatown best and get a few insider tips guaranteed! The huge standing Buddha statue is part of the Wat Intharawihan temple and is located only a short Tuk Tuk ride from the Phra Arthit pier. 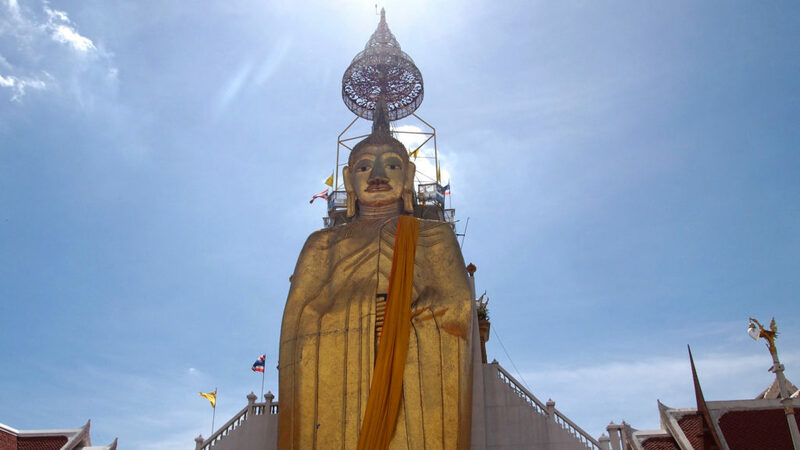 The 32 meter high statue called Luang Pho Tho is decorated in gold leaf and glass mosaic and looks very impressive. You should definitely visit the temple at least once. More temples that are totally worth a visit you can find in our temple guide. The Hindu Sri Mariamman Temple (also called Wat Khaek), is one of the main temples of the Non-Buddhist population of Bangkok. It is on the corner Pan Road and Silom Road. The temple is dedicated to the deity Mariamman, but also has lots of other Hindu god statues inside. While we were visiting, they played such an exhilarating mantra all the time and its melody did not leave our heads for hours. A very nice atmosphere. However, it is not allowed to take pictures inside of the temple. 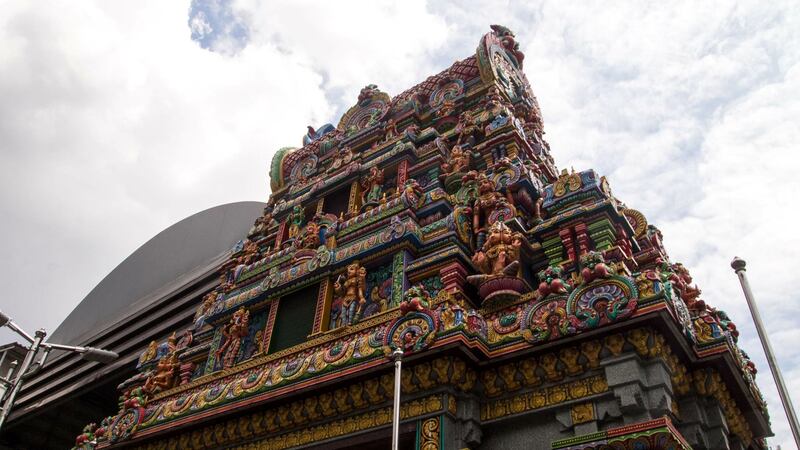 You can reach the Sri Mariamman temple within a 10 minutes walk from the BTS stations Sala Daeng or Chong Nonsi. Definitely worth a visit. Let’s stay in the Silom Road. 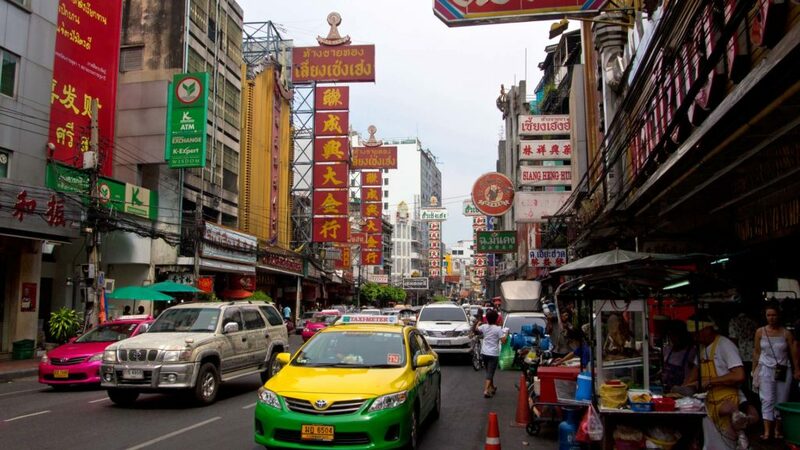 Not only the Hindu temple is located on this street, which leads from Lumphini Park almost to the Chao Phraya river, but also hundreds of hotels, shops and the Patpong Night Market. 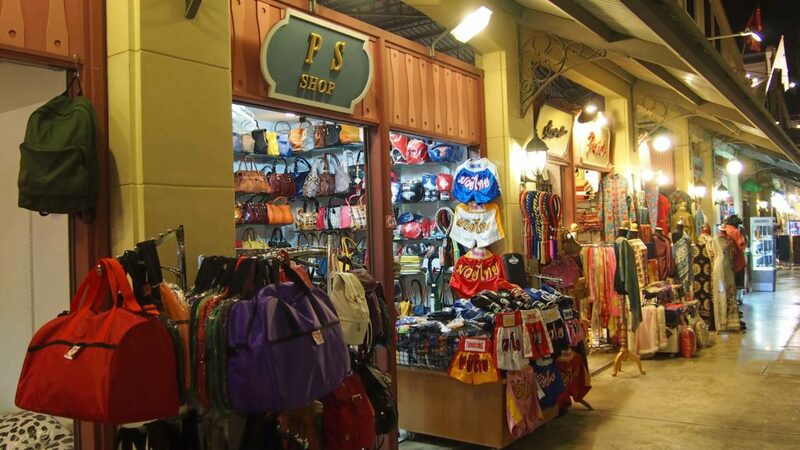 More specifically, it is located in the streets Patpong 1 and Patpong 2. The night market is very famous for its red-light district, but this does not strike that much compared to the stands with all levels of counterfeit stuff. At the other end of the roads there are also many street stalls where you can have some nice and cheap Thai food. Ko Kret is an island 20 km north of Bangkok, which is located in the Chao Phraya River and is great for a day trip. 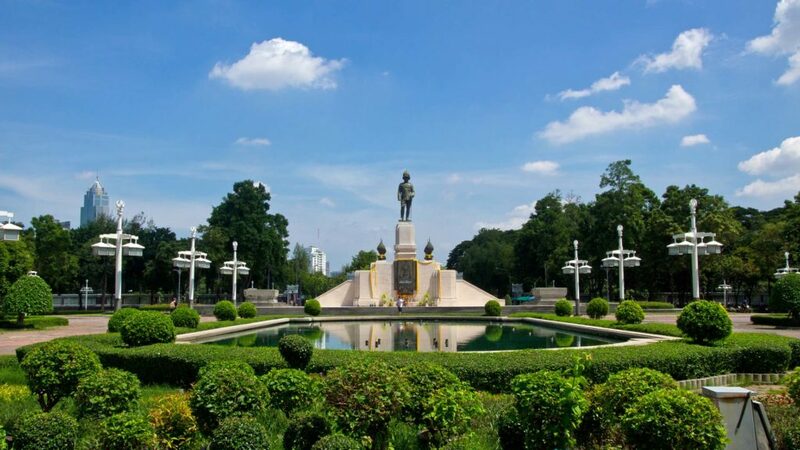 You can take a bus (number 155 or 505) from the Victory Monument or the shopping mall Central World in Pak Kret or the Chao Phraya Express boat using the green flag. Both for very modest fees. From the Pak Kret station it is only a few meters to the ferry terminal, where the ferry will bring you to the island for just 5 baht. The island with temples and lots of food stalls can be walked around in within 2-3 hours. When I was there, it was flooded and the Chao Phraya has put half of the island under water, which should not prevent you from walking around. The island is also known for its pottery, of which I have not seen much somehow. Still, a very nice day trip and it takes you away from the big city! 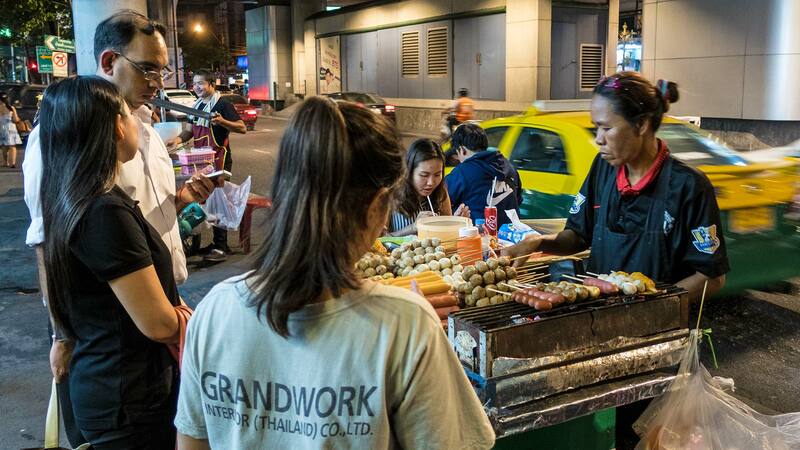 A must in Bangkok is to try the street food. Spread all over the city, there are countless stalls offering simply everything. From food stalls with noodle soup to street stalls with grilled snacks, fruits, healthy drinks – you can try something small everywhere. There is so much to try that you could eat all day, so it’s best to keep it small and simple. You can also find some stalls during the day time, but most of them start selling as soon as it gets dark. A sure thing not to miss! If you don’t want to try all those treats on your own, how about a culinary tour with a small group through Bangkok’s old town? I promise there is some Thai food for everyone. If you have some spare time left in Bangkok, then you can take a day trip to the ancient city of Ayutthaya (which was the former capital of the Kingdom of Siam). 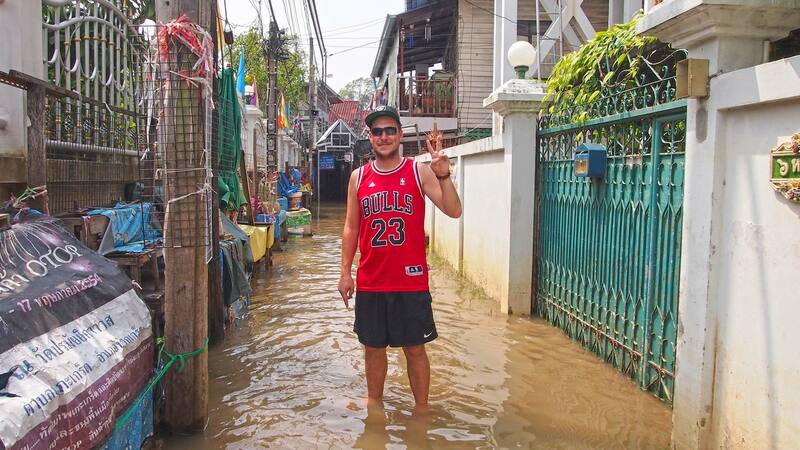 Have you ever been to Bangkok? How did you like it? 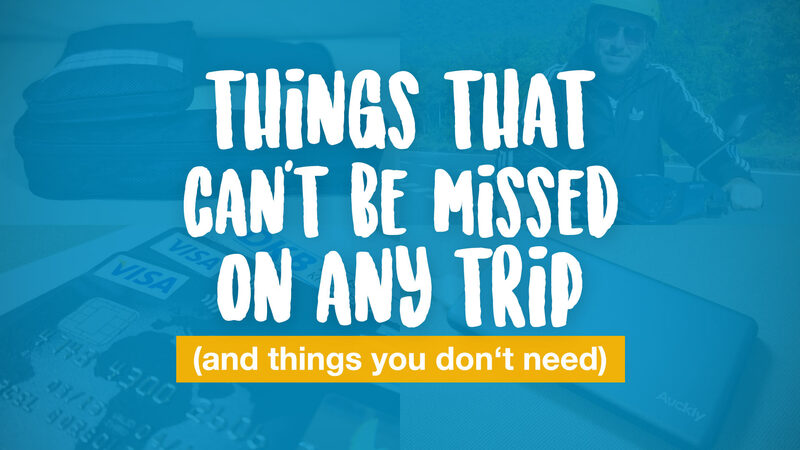 Is there something missing in this list that we should add? Leave us a comment! Thank you, Tobi! Keep on exploring the world and share your experience! I love your blog post. 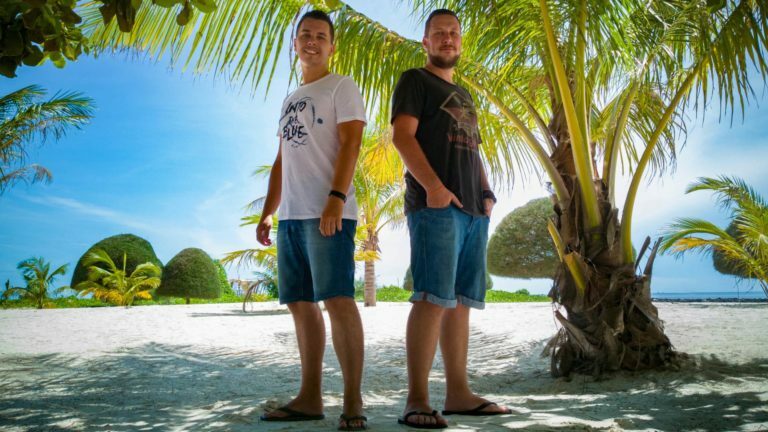 I really enjoyed your amazing tips as I´m planning to go to Thailand in January. Don’t know if you have been to the restaurant The Deck yet? It is right opposite Wat Arun, they serve great food (Italian/western and Thai), there is a lovely roof top bar, and the view over the Chao Praya is beautiful. Especially at night. Prices are reasonable too. Highly recommend it, if you haven’t made it there yet. I lived in Bangkok for 14 years, and it’s always been one of my favorite places to eat. And nice photos, btw!! Hi, thanks for the tip. Sounds really great, will check it out the next time I’m visiting Bangkok!